Route 66, one of the most well-known roads, all 2,448 miles of it, begins at the intersection of Adams Street and Michigan Avenue in Chicago. It runs through eight states (Illinois, Missouri, Kansas, Oklahoma, Texas, New Mexico, Arizona, and California) and was opened in 1926. It's a journey through the heartland of America and the sights are spectacular. The whole journey won't be as swift as it would be on the interstates, but then you wouldn't be treated to such historical sights off the beaten track. Whether it's the famous neon signs you want to see, the old restaurants that still serve great food, the churches or historical buildings, or the many motels you can opt to overnight at, there's so much to see along the way in the form of natural beauty. Beautifully illustrated with stunning photographs, this book offers a great insight into the attraction that is, was, and is again, Route 66. 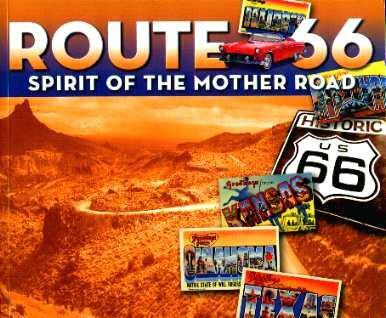 There is a wealth of useful information in this book and it's a perfect tool to use before embarking on your journey on Route 66. Make notes of interesting things to see (sadly you probably won't be able to stop at each and every one unless you have no time restrictions) as you plan your historical drive. There's so much to see it would be a good idea to know what's what ahead of time. Conclusion - Delightful book to reminisce about this famous old road.